Today, the Sisters, teachers, students and staff of the schools and homes of St Joseph of the Apparition around the world are celebrating the feast of their foundress, St Emilie De Vialar. To a certain extent, Emilie’s story is similar to that of St Paul. 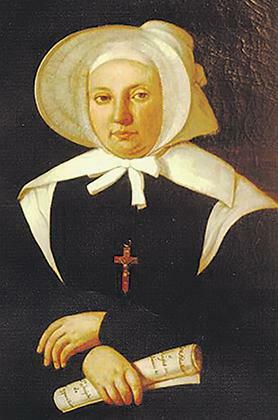 In 1845, St Emilie De Vialar, born in Gaillac, France, was on her way from Tunis to Algeria. The ship on which she was travelling was caught in a terrible storm and for nine days, Emilie and the other passengers were caught between sea and sky. For fear of losing lives, Emilie made a vow “that wherever they landed safe and sound, she would open a house and dedicate it to St Paul”. It so happened that Emilie and the Sisters that were accompanying her, Sr Elizabeth Monistrol and Sr Therese (or as she was known Giuseppina Ceccarelli) landed safely on the shores of Malta. St Emilie De Vialar opened a house at 5, St George Street, Vittoriosa. Her intentions were to open a boarding school and a day school for girls from poor families. The Sisters of St Joseph were the first apostolic sisters on the island. It seems that Emilie was one of the first persons to open a Catholic School for young ladies in Malta. She is considered a pioneer in education and records in the Maltese archives show the title ‘Emilie, Baroness De Vialar, Head of School’. There were then 30 girls. It should be noted that only cloistered orders existed in Malta at that time, so many young girls aspiring to religious life had no other choice. Records show that by August 1845, nine postulants had already joined the congregation. Later on, these became noted missionaries in Myanmar, Australia and Tunisia. According to the people living in the Vittoriosa area, the house in which Sr Emilie and the first Sisters lived at Vittoriosa was haunted and the Sisters had to abandon it in 1846. They went to live at 5, Frederick Street, Valletta. Here, the school flourished and the Sisters were esteemed and loved by all until 1858, when difficulties of every type forced them to close down the premises and transfer the school to Cospicua. They relocated to 96, Strada Buongiorno, Cospicua, which is now called Sir Matty Grima Street. Meanwhile, Bishop Gaetano Pace Forno, asked for a Sister to direct the work in Cospicua. For this reason, Sr Cherubina Talchi was sent there until 1889 when the Conservatorio was entrusted completely to the Sisters. An extract from the document France Catholique en Tunisie confirmed that there were two Italian and two French Sisters who catered for the education and care of 100 girls. This was the Conservatorio at St George’s Street. The number of children continued to increase and eventually more room was needed. Cospicua could not offer enough space for such an establishment. So the Sisters turned to Sliema, which was then a developing town. They were interested in Capua Palace, but the price was beyond their means. In 1880, Bishop Pietro Pace offered the Sisters a plot in Cathedral Street, Sliema. Work started at the earliest and the building was erected within a year. The Cospicua School was closed down. In 1903, another school was opened in Zachary Street, Valletta, and eventually this was transferred in 1958 to Blata l-Bajda. In 1910, the need for another school was felt and the Sisters opened a third school in Paola. This is presently known as Mater Boni Consilii School. During World War I, the sisters were scattered in different homes in Lija, Rabat, Ħal-Bajjada and Mdina. Some sisters were even harboured in homes of Sisters’ families or friends. Three of the sisters, Sr Berchman Smith, Sr Celestina Mazzotta and Sr Frances Raimondo were sent to Paola. Their first house was situated in Tarxien Road. In 1916, the Sisters moved to Żabbar Road. During World War II, Paola was requisitioned to serve as a hospital. But this period did not last long because of its proximity to the dockyard, which was considered a target for the enemy. During those years, the Sisters ran three schools and were entrusted with the responsibility of the Episcopal Conservatory in Cospicua. Meanwhile, the Rabat population asked the Sisters to remain in the locality, even though they had no place to stay in the village. A gentleman very generously offered his villa at a moderate price and, in 1944, another school was opened at Villa Messina in Rabat (today known as St Joseph’s Convent). It soon became clear that the number of Sisters was insufficient to run four schools with the increasing demands of education. For this reason, it was decided to turn the Rabat school into a day and boarding school for boys up to the age of 12. In 1997, after just over half a century of existence, the school was closed down. It should also be noted that some years earlier, in 1984, the Conservatory in Cospicua was transferred to Żabbar and became known as Dar Sagra Familja, to continue to host and take care of children with social and emotional difficulties. The political upheavals in Asia in 1965 forced the missionary sisters to move out of the country. Malta was considered the ideal place for them. Time seemed ripe to open a rest house for the elderly Sisters and a house was opened in Balzan which later on, in 1984, was transferred to Rabat on the same grounds, then known as Villa Messina. Sometime later, part of the complex served as a place for retreats – a house of prayer open to lay people and religious alike. In 1965, Sr Victoria Ransley, who was Provincial at the time, was offered the responsibility of Fatima Hostel for girls in Sliema. In 2009, this work was passed on to the Ursuline Sisters. Today, there are 62 sisters in the Province of Malta-Tunisia-Ethiopia who are led by their Provincial, Sr Cecilia Schembri. 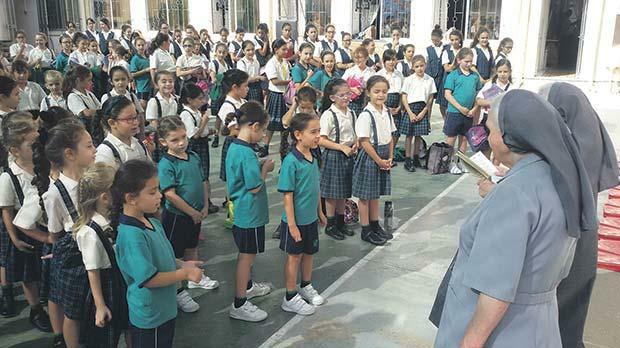 The Sisters try to live out the charism of St Emilie De Vialar and are attentive to the needs of those entrusted to their care: through education in Paola, Blata l-Bajda, and Sliema; the children’s home in Żabbar, the Retreat House in Rabat and various other apostolates. The charism of the Sisters is shared by their lay associates. We rejoice that during this month we are being visited by the Superior General, Sr Dorothy Vella-Zarb and her councillor, Sr Marie Kyi. Kenneth Vella is headmaster at Mater Boni Consillii – St Joseph School, Paola.